Senior Credit Analyst, Sebastien Poulin, provides an overview of collateralized loan obligations (CLO). He explores the lifecycle of a CLO and how they fit as a part of our Multi Asset Credit Fund strategy. Differentiated stock selection across the corporate Life Cycle has allowed the Global Equity strategy to outperform in the last three years, despite a the process focus on a valuation discipline leading to an overweight to value and valuation factors. As a result of stock picking, the strategy was able to outperform in both 2016 and 2018 despite these being very different years for market styles. In this webinar, the Head of Global Equities Peter Rutter recaps on this investment process and demonstrates the power of investing across the corporate Life Cycle with the team’s differentiated process. The framework is brought to life through three stock examples, each at a different stage in the Life Cycle. Ewan McAlpine, Senior Client Portfolio Manager is joined by Head of Fixed Income, Jonathan Platt, Head of Rates and Cash, Craig Inches and Head of Global High Yield, Azhar Hussain to discuss their views on fixed income markets as we look ahead to 2019. Peter Rutter, Head of Equities will be focusing on the factors that influence how RLAM’s Global Equity funds perform and how these fit with clients’ wider portfolios. In previous webinars Peter has introduced the differentiated and proven investment process employed by the RLAM Global Equity fund managers. This process leads to differentiated portfolios with performance driven by stock selection and some clear and consistent style and factor characteristics. In particular the funds have tended to perform best when valuation factors are outperforming and there is a risk-off environment in equities. Peter will explain why this is consistent with the investment process and consequently how the portfolios might fit a strong complement to managers with more global growth and larger cap exposures in global equities. Fund Manager, Khuram Sharih shares our latest update on multi asset credit. During the webinar Khuram will update on this area of the market before turning to the current positioning of the Royal London Multi Asset Credit Fund. There’s a temptation to think that both equity and credit investors should look at ESG in the same way. This approach can lead to a quicker roll-out, as existing, more established equity process can just be used for credit analysis. In this session, RLAM's Ashley Claxton and Martin Foden will explain why they think that the scope and application of ESG factors is quite different: from the different make-up of bond indices, to the subtleties of bond structure, a differentiated approach has to be taken. The only similarity? That if ESG is seen as an ‘extra’ part of your security analysis, you’re probably not doing it right. Ashley Hamilton Claxton is responsible for coordinating and overseeing RLAM’s approach to responsible investing across all of our asset classes. She has management responsibility for our company engagement, corporate governance analysis, and proxy voting. Ashley is RLAM’s subject matter expert and spokesperson on responsible investing and corporate governance. Martin Foden joined RLAM at the start of 1998. He initially joined RLAM's UK Equity Team, with responsibility for analysing the transport, business services and construction sectors, as well as managing balanced pension funds. This experience greatly enhanced RLAM’s credit research capabilities when he joined the Fixed Income Team at the beginning of 2003. Since moving to the Fixed Income Team, he has been instrumental in developing RLAM’s analytical process through the advancement of the team’s cashflow forecasting and evaluation of issuer structures. Sebastien Poulin, Senior Analyst for the High Yield and Multi Asset Credit team at Royal London Asset Management explains the main characteristics of the leveraged loan market; an update on recent performance in the leveraged loan market and the importance of credit selection in today’s credit environment. 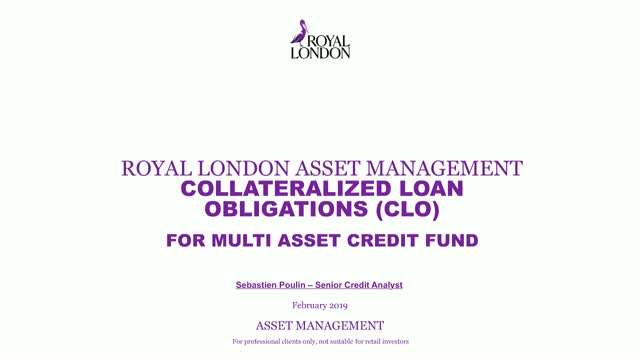 This leveraged loan webinar is in relation to the Royal London Multi Asset Credit Fund that was launched in July 2017. Will Kenney, Senior Fund Manager, presents our latest global equity monthly update. He explores why asset reinvestment in aggregate has been weaker in listed equities since the global financial crisis. This shortage of internal investment opportunities for companies has led to less capital reinvestment and increasing share buy backs and acquisitions. He explains how the RLAM equity team approach, based on lifecycle insights, helps to identify corporate wealth creation which is the dominant factor in long term shareholder returns. Mike Fox, Head of Sustainable Funds, explores the case for sustainable investments, why it is becoming more mainstream, and how the sustainable process aims to be additive to the investment performance. Mike provides an update on the RLAM team’s approach to sustainable investment and some of the key themes in the current market. Ewan McAlpine presents our regular six-monthly update on fixed income markets, sharing current themes he has seen within the market and providing his outlook for the full spectrum of fixed income assets. Khuram Sharih, Fund Manager, presents a webinar update answering key questions around the multi asset credit market and positioning within the Royal London Multi Asset Credit Fund in light of ongoing uncertainty. In our regular monthly update, Senior Fund Manager, James Clarke reflects on global equity market conditions. In our regular monthly update, Head of Equities, Peter Rutter reflects on global equity market conditions. Craig Inches, Head of Rates and Cash and Richard Nelson, Senior Fund Manager provide our regular cash update webinar. They will look at the current market environment for cash and share an overview of RLAM’s cash strategies. Head of Responsible Investments, Ashley Hamilton Claxton will discuss the increasingly important area of corporate governance as well as touching on other environmental, social and governance (ESG) themes.